Q: Will 1-3, 1-6 beta glucans trigger a yeast allergy? A: No. 1-3, 1-6 beta glucan is an isolate and does not contain enough yeast protein to cause an allergic reaction. Q: Why is the Wellmune ® brand ingredient so important? A: Wellmune has been called “the most important development in clinical immunology in the last 30 years”. An independent university study conducted at the James Graham Brown Cancer Center at The University of Louisville demonstrated that Wellmune is significantly more effective than all other nutritional supplements in enhancing the ability of the immune system to protect the body. Q: Are there any side-effects as a result of taking ImmunoShield? A: No. Wellmune has been demonstrated as the safest and most effective immune health ingredient in numerous peer-reviewed clinical (human) and preclinical scientific studies. Q: How often should I take ImmunoShield to keep my immune system strong? A: The key cells in the innate immune system are renewed every 36 to 48 hours. 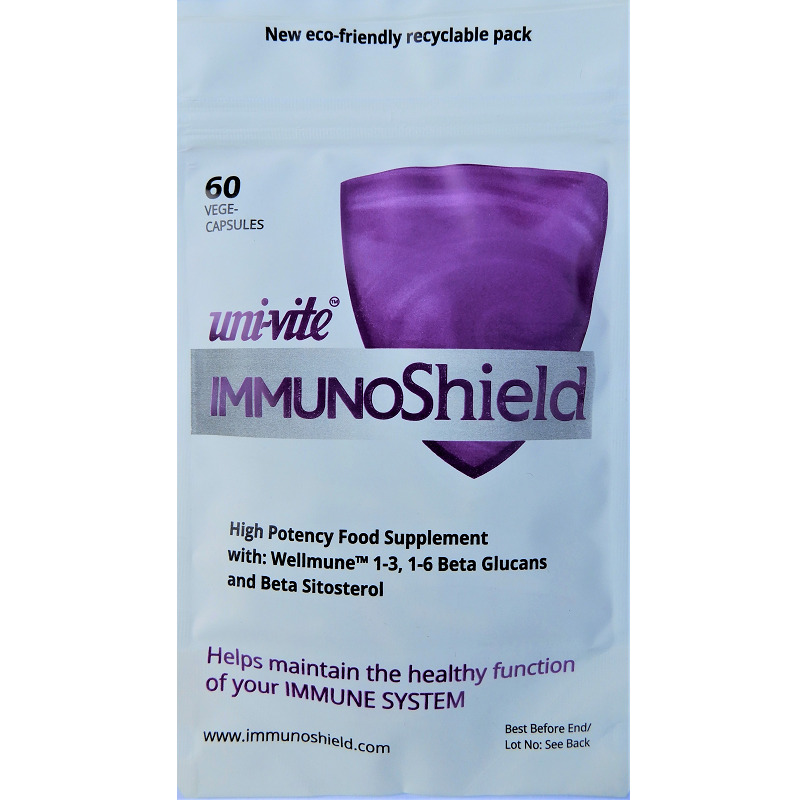 As a result, the recommended ImmunoShield adult protective dose is one (1) caplet (250 mg Wellmune beta glucan) per day, preferably taken on an empty stomach. Q: Can I take more ImmunoShield if I’m exposed to viruses eg. colds and flu? A: Yes, we suggest increasing the dose to 2-3 caplets per day (taken at intervals) at times of increased viral or bacterial threat such as the winter flu season, or travelling by air. Q: Is there a special dose for children? A: As ImmunoShield is so safe, children could take the same dose as adults. However, they do not actually need this much. Halve the dose for children up to 50kg in weight. Crush the caplets if necessary. Q: What else can I do to improve the status of my immune system? Uni-Vite’s NutriShield (link below) is an exceptionally comprehensive supplement that has been formulated to give optimum baseline support to the body’s overall healthy functioning, including the immune system.